My Hubbie LOVES chicken wings so when we went to Mexico last year and one of the bars pretty much had them on tap, he was in his element. One of his favourite sauces to have them lathered in was the lovely, spicy Buffalo sauce and so as soon as we got home I tracked down a bottle of the lovely stuff. It was much easier to find than I was anticipating as I found most big supermarkets sell it (I’ve seen it in Tesco and Sainsbury’s). 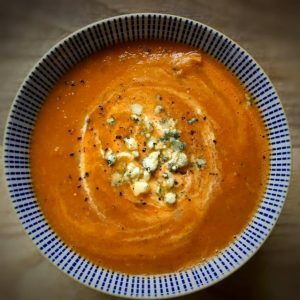 Having commandeered a bottle, I started to think up interesting ways to use it (given Chicken Wings aren’t the healthiest thing to be having all the time) and I came up with the idea for this lovely soup. It really is the perfect winter warmer. Both tangy and packed with flavour, this soup is a great way to use up left over roast chicken. If you want to use chicken breasts instead you can do. Just bake them in the oven, shred and add at the end. Take a large sauce pan, spray with 1kal and add the onion, celery, carrot and garlic. Season with salt and pepper and fry for 5-6 minutes until the onions have started to soften. Add a little water if the pan gets too dry. Next add the chilli powder, cumin and paprika and fry for another minute then add the tomatoes, chicken stock and hot sauce. Leave to simmer for 20-25 minutes until the carrots and celery are soft. Remove from the heat, add the fresh coriander and blitz with a handheld blender or food processor. Then add the shredded chicken and blue cheese and bring back to a simmer on the heat so that the chicken is warmed through and the cheese melts into the soup. Season with salt and pepper to taste. Remove from the heat and pop into four bowls. Stir ½ tbsp. soured cream into each bowl and top with a little sprinkle of crumbled blue cheese. This recipe sounds great! I’m not a huge fan of blue cheese so I think I’d leave it out. How many smart points would each serving be without the cheese?? Hi Laura, We’re not the greatest fans of blue cheese (despite trying endlessly to like it!) so can I ask if you recommend any substitute for it instead? I’ve made this as a sauce for pasta – no water so nice and thick. Was sublime! I did the same a few nights ago and it was lovely!! Great minds Debbie! haha! I’m such a fan of your recipe ideas and keen to make this soup this weekend. I was just wondering if you’ve frozen it once made, or if it should be eaten fresh? I’m not the biggest soup fan but as a breastfeeding mumma I need healthy food that fills me up and sustains a hungry bubba too! This is the nicest soup I have ever eaten! Simple to make, low in points (I split it into 2 portions not 4 but I have a lot of points because of breast feeding) anc so filling. This is already a firm favourite and I will be making this again! So pleased you both liked it Graham! Had a major cookathon of Laura recipes yesterday and this soup was sublime. Lots of interest in each spoonful, a nice chilli kick thanks to the buffalo sauce (Tesco’s did have it as you said) and filling. Just made this soup and it was fabulous.